With the 6th, 12th and a large part of 18th Army destroyed in the Uman pocket by 8th August, the whole south flank of Southwestern Front and the northern flank of Southern Front were now shattered, making any defence of the territory west of the Dnepr untenable. From north to south, the Southwestern Front now deployed the 5th Army (north of Kiev and in the Pripet Marshes), the new 37th Army in Kiev, the 26th Army south of Kiev behind the Dnepr, the new 38th Army at Kremenchug behind the Dnepr, and the mobilising (second) 6th Army at Kharkov. From north to south, the Southern Front now deployed the mobilising (second) 12th Army near Dnepropetrovsk, the remains of 18th Army retreating towards Nikopol on the Dnepr, and 9th Army retreating towards Nikolayev on the Bug River. In addition the 51st Separate Army was mobilising to defend the Crimea. By 8th August Army Group South was moving to clear the Soviet forces west of the Dnepr and making preparations to cross the river south of Kiev. 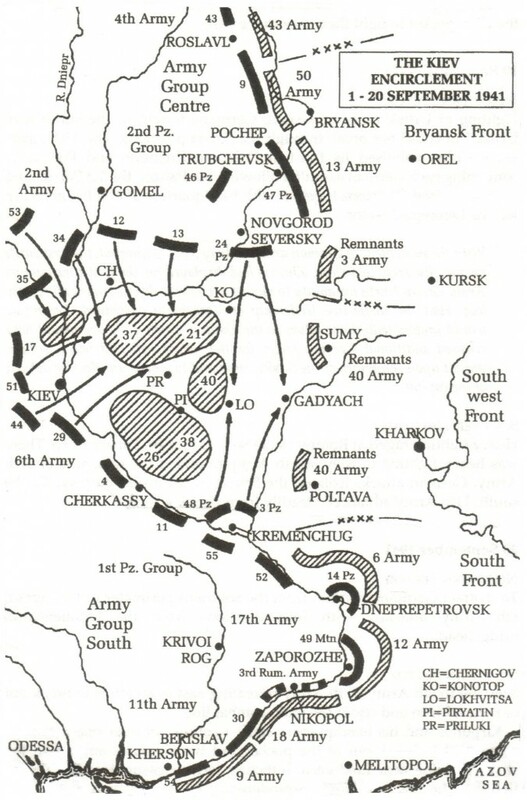 The 6th Army was exerting significant pressure on the 5th and 37th Armies around Korosten-Kiev, with the Soviets having to launch counter-attacks to keep the Germans out of Kiev itself. The 17th Army was advancing eastwards, north of the Bug River towards Kremenchug on the Dnepr. The 11th Army and Rumanian 3rd Army were marching south-east towards the Black Sea coast and Nikolayev, and the Rumanian 4th Army was ingesting Odessa. Meanwhile Army Group South’s main mobile offensive force (1st Panzer Group) was somewhat dispersed. The 3rd Panzer Corps was moving south-eastwards along the Dnepr River line towards Cherkassy and Kremenchug. The 48th Panzer Corps was at Kirovograd and advancing towards Krivoirog. The 14th Panzer Corps was near Pervomaisk and was planning to wheel eastwards and head for Dnepropetrovsk. Evidently Rundstedt was attempting to catch the Southern Front’s 18th and 9th Armies before they could retreat over the Dnepr, as well as planning for a breakout across the Dnepr River. By 10th August Southern Front’s 9th Army had begun the difficult task of evacuating its forces to the eastern bank of the Bug River at Nikolayev. This operation was successfully completed by 14th August, with the 9th Army also destroying the naval installations at Nikolayev. Meanwhile the 18th Army was attempting to prevent the premature capture of Krivoirog and used the 2nd Cavalry Corps (a premier pre-war unit rushed north by Southern Front) in attempts to block the 48th Panzer Corps’ advance. On 16th August (at the request of the theatre commander Budenny) the Stavka ordered the withdrawal of Southwestern and Southern Front units behind the Dnepr, with the exception of 37th Army which was to defend western Kiev. This meant that the 5th Army, isolated in the Pripet Marshes, was to fall back across the Desna-Dnepr Rivers and join the main combat line. Also by this time the new 6th Army (from Kharkov) was deployed around Dnepropetrovsk and the new 12th Army was deployed further south around Zaporozhe. Both these armies were assigned to Southern Front which now controlled 4 armies from the Black Sea coast to just north of Dnepropetrovsk. By 17th August German forces had reached Krivoirog and on 18th August Soviet engineers blew the dams at Dnepropetrovsk. This prevented the dams and the vital crossing from falling into German hands, but the rising water levels destroyed the remaining crossings points for the retreating 18th and 9th Armies further downriver (and presumably lowered the water level upriver). Fortunately the bulk of 9th Army had already crossed and was now deploying around Kherson. However the depleted 18th Army (a large part being caught in the Uman pocket) was still mostly on the west bank of the river and faced a very difficult time retreating across the river while fending off the Germans. On this date the SS LAH Brigade (detached from the 48th Panzer Corps main body) also reached Kherson, near the mouth of the Dnepr, and started fighting for the town. By 19-20th August forward elements of the 3rd and 14th Panzer Corps were near Dnepropetrovsk and Zaporozhe, and were already engaging with the 6th Army. In the north the Soviet 5th Army was pulling out of Korosten, although the 6th Army’s 17th and 51st Infantry Corps realised what was happening and attacked; inflicting heavy casualties on the retreating 5th Army. On 21-22nd August Kherson was captured by 1st SS LAH but by this time the 18th and 9th Armies had managed to evacuate across the Dnepr. In the north 6th Army launched a concerted attack against the retreating 5th Army: 51st Corps rushed the retreating defenders (the 27th Rifle Corps) and gained a crossing (of the Dnepr) at Okuminovo, north of Kiev. By 23rd August the 5th Army was in full retreat with elements of 6th Army already crossing the Dnepr and reaching the Desna River at Oster north of Kiev. This now threatened 5th Army’s line of retreat across the Desna as the situation around Kiev went from bad to worse. This sudden development threatened to undermine the entire Dnepr position because 5th and 37th Army were now under real pressure to hold on to Kiev and the Dnepr-Desna river line north of the city. By 28th August 12th Army had fallen back from Zaporoche, under pressure from 14th Panzer Corps, and destroyed the hydroelectric dam which flooded large parts of the town. At around this time the Stavka decided to remove Tyulenev (Southern Front’s commander) and replace him with Ryabyshev (38th Army’s commander). The reason for this is unclear, and is surprising after Tyulenev had just successfully conducted a fighting withdrawal with 18th and 9th Armies behind the Dnepr: this type of military operation is always one of the most difficult, especially when being pursued by a German panzer corps. Rundstedt now issued orders for 17th Army and 1st Panzer Group to concentrate and cross the Dnepr south of Kiev (around Kremenchug), while 6th Army was to do the same north of Kiev and in Kiev itself. On 31st August the 17th Army’s 52nd Corps and elements of 3rd Panzer Corps assaulted the Soviet 38th Army across the Dnepr River around Kremenchug. The Germans rapidly established a bridgehead and the infantry from 52nd Corps poured across. Over the next few days the fighting raged around Kremenchug as the 26th and 38th Armies struggled to contain the German build up in the bridgehead. Meanwhile in the north, 6th Army hit the 37th Army in Kiev and the 5th Army north of Kiev. The latter attack with 6th Army’s 51st Corps made headway across the Desna just north of Kiev, pushing back 5th Army’s southern flank. By 7th September, after a week of heavy fighting, the best efforts of 26th and 38th Armies could not contain the Germans around Kremenchug. The bridgehead had steadily expanded principally due to the efforts of 17th Army’s infantry divisions which had successfully beat off all Soviet attempts to counter-attack and eliminate or contain the bridgehead. At around the same time 14th Panzer Corps (with 5th SS Motorised Division Wiking) launched strong attacks further south against the 6th Army around Dnepropetrovsk. It is not clear whether Rundstedt was attempting to form another ‘breakout bridgehead’ or simply draw Soviet forces away from the main effort around Kremenchug. In the far north the German 6th Army was also piling on the pressure north of Kiev: its attacks (along with the 2nd Army’s attacks coming down from the north) threatened to trap the Soviet 5th Army. Despite 5th Army’s increasingly untenable position, the Stavka refused 5th Army permission to withdraw. By 8th September the entire Southwestern and Southern Front’s Dnepr defensive line was in tatters; even without the attentions of Army Group Centre coming down from the north. Up till this time Army Group Centre’s 2nd Panzer Group and 2nd Army had been defeating and breaking through Central and Briansk Fronts, and were only now starting to come into direct contact with Southwestern Front’s northerly forces. Army Group South now had four bridgeheads across the Dnepr: the main ones around Kremenchug and north of Kiev, and two lesser ones at Dnepropetrovsk and Berisalav. By 10th September the 17th Army had the 52nd, 55th and 11th Corps across the Dnepr and in the (by now large) Kremenchug bridgehead. The regrouped 48th Panzer Corps was now also deploying into the bridgehead with 16th Panzer Division leading the way. In the north the 5th Army had been belatedly ordered to fall back behind the Desna; only to find its line of retreat cut by 2nd Army moving southwards. 5th Army was now trapped between the German 6th and 2nd Armies. The Southwestern Front’s overall supply and readiness condition. By now most units in Southwestern Front were short of supply and many were dispersed. The deteriorating supply situation (especially fuel and ammunition) was greatly exacerbated by Luftflotte 4 having now achieved air superiority over the southern theatre, and which was carrying out round the clock interdiction. Compounding this was the fact that by 10th September there was only one railway line left into the Kiev salient; via Lubny and Mirgorod. Southwestern Front had almost no intact mobile forces left. The many mechanised and cavalry corps present in June and July were now completely gone or were effectively infantry without tanks and trucks. Mobile forces would have been essential to block any panzer corps’ thrusts as well as to counter-attack. By now the large majority of Southwestern Front was only able to move on foot. Enemy air-superiority and subsequent air-interdiction. Any mass movement by Southwestern Front eastwards would have come under very intense interdiction attacks. This would have further delayed most units trying to move eastwards out of the salient. The last railway line into the salient (see above) was already broken. Most of Southwester Front’s forces were already very heavily engaged and effectively ‘pinned down’ by several German infantry armies. Any attempt to withdraw (which the German 6th and 17th Armies were expecting) would have come under immediate attack. Witness what happened to 5th Army when it started withdrawing north of Kiev: it never really managed to stabilise the front in its sector after this. The speed with which the encircling panzer corps could now move. By 10th September, 24th, 48th and 14th Panzer Corps were all in positions were they could easily ‘outrun’ any Southwestern Front forces attempting to withdraw. This was largely due to Southwestern Front having almost no effective mobile units left. All these parameters meant that the massive Southwestern Front was already doomed. On 12th September Army Group South sprung the trap. 1st Panzer Group launched its attack from the Kremenchug bridgehead and in short order 16th and 14th Panzer Divisions were pushing through the defences of 38th Army. By 13th September lead elements of the 3rd Panzer Division (Army Group Centre’s 2nd Panzer Group/24th Panzer Corps) reached Lubny from the north, while elements of 16th Panzer Division (Army Group South’s 1st Panzer Group/48th Panzer Corps) reached the outskirts of the town from the south. 1st Panzer Group’s 9th Panzer Division moved up on the east flank of the penetration and seized Mirgorod (east of Lubny) while 14th Panzer Division moved to protect the eastern flank of the penetration to protect the 16th’s flank and rear. On 14th September the 3rd and 16th Panzer Divisions linked up near Lokhvitsa (directly east of Kiev). Southwestern Front was now effectively isolated in what became known as the Kiev Pocket. The Kiev Pocket contained the entire Southwestern Front command along with the 5th, 37th, 21st and 26th Armies, and most of the 38th and 40th Armies: a total of at least 765 000 Red Army soldiers. By 16th September the Germans started pulling 2nd Army back onto the Moscow axis, because Army Group South’s 6th Army was now able to link up with Army Group Centre’s 2nd Panzer Group. Meanwhile Southwestern Front attempted to organise itself and attempt a breakout. Unfortunately the armies in the pocket were already being force to fight in isolation as German pressure started to cut into and break up the pocket: 26th and 38th Army around Orzhitsa in the south, 37th in and southeast of Kiev, and (remnants of) the 5th, 21st and 40th Armies between Priluki and Lubny. By 17th September Stalin belatedly agreed to let Southwestern Front withdraw! Historically this could be considered a bad joke, except for the absolute tragedy now facing the Red Army soldiers in the pocket. On 18th September elements of Briansk Front (and remnants of 40th Army) attempted to breakthrough 24th Panzer Corps around Romny and relieve the Soviet forces in the pocket. At the same time Southwestern Front forces were now all given a blanket order to fight their way out to the east. Fighting continued inside and outside the pocket over the next few days, but the perimeter steadily decreased as the pocket fractured, and the Soviets never got close to breaking into or out of the pocket. By 20th September the German 6th Army captured Kiev as the now isolated 37th Army attempted to withdraw eastwards and join the main body. On this date Kirponos and his staff attempted to infiltrate through the lines but the column of around a thousand men was ambushed near Lokhvitsa. Most of the column was wiped out or captured, and Kirponos was killed and Potapov captured. By 21st September 2nd and 1st Panzer Groups were already counter-attacking the forces attempting to break into the pocket, and by 22nd September resistance in the pocket started to collapse. On 23rd September the isolated 37th Army surrendered and by then an estimated 290 000 men had already surrendered. On 24th September the main body of the 5th and 21st Armies surrendered, and on 26th September the last significant units in the pocket also surrendered. The Kiev Pocket remains to this day the largest single pocket of enemy combatants ever encircled in the history of warfare. It ultimately yielded over 665 000 POWs; the largest number of POWs ever captured during a single battle. * In excess of an additional 100 000 Red Army soldiers were killed in the pocket. * The closest to this record being the 658 000 POWs captured in the Briansk-Viazma pockets in October 1941 during Operation Typhoon. Army Group South’s main body now redeployed for the drive east. 6th Army deployed for a thrust towards Kharkov, 17th Army assembled for an advance into the Donbass, and 1st Panzer Group regrouped for a thrust south-eastwards towards the Azov Sea. The latter’s objective was the encirclement of Southern Front, now withdrawing eastwards from the attacking 11th Army in the south. 1st Panzer Group was now reduced to only two panzer corps (the 3rd and 14th) because the 48th Panzer Corps was transferred to 2nd Panzer Group. Army Group Centre’s 2nd Army was already redeploying east of Briansk, while 2nd Panzer Group was moving up south of 2nd Army to (finally) launch its offensive towards Moscow. By 28th September Army Group South occupied a line from: the shores of the Sea of Azov, just east of Melitopol, the Dnepr bend bridgeheads at Zaporozhe and Dneprepetrovsk, through Krasnograd and Poltava, and just east of Romny. At Romny the new ‘border’ with Army Group Centre started, which was now preparing for Operation Typhoon. While the main body of Army Group South was focused on destroying Southwestern Front, the German 11th Army, and the Rumanian 3rd and 4th Armies, were left to deal with Southern Front. They were tasked with breaching Southern Front’s defences on the Dnepr south of Zaporozhe, advancing on the Crimea, and capturing the fortress port of Odessa. By late August the 11th Army (with two infantry and one mountain corps) occupied a line on the Dnepr River opposite the Soviet 9th and 18th Armies from Kherson to Berislav, the small Rumanian 3rd Army was just north of this position, and the Rumanian 4th Army had surrounded Odessa. 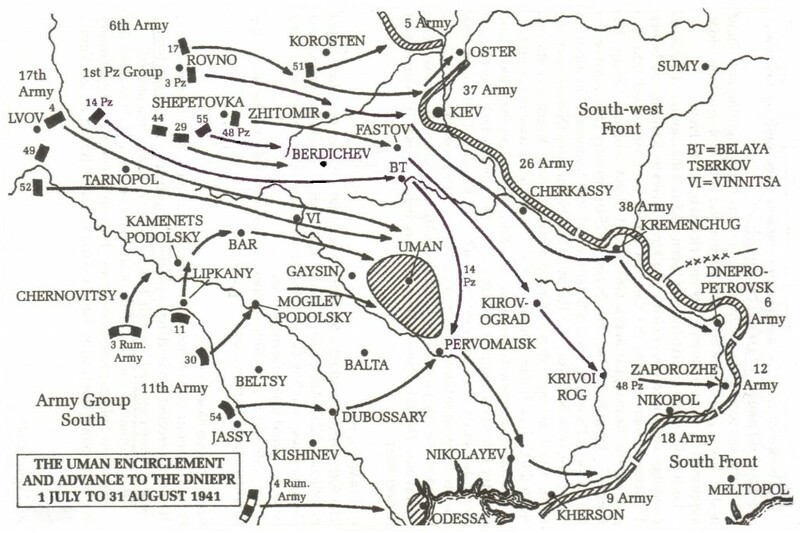 In early September the 11th Army’s 30th Corps forced its way across the Dnepr at Berislav. The success of this operation was due to the 22nd (Air Landing) Infantry Division which undertook the hazardous assault crossing against the Soviet 9th Army. 30th Corps rapidly expanded the bridgehead and had captured the nearby town of Kachovka by 3rd September. By 10th September 30th and 54th Corps had consolidated and expanded the bridgehead, pushing back the 9th and 18th armies, so that the bridgehead was now over 50km wide and 25km deep. On 13th September Manstein was appointed commander of 11th Army and quickly set about the next phase of operations. At his disposal were the 30th and 54th Corps, and the 49th Mountain Corps. By 17th September 30th Corps was advancing on Melitopol (against 9th Army) and had reached the shores of the Sea of Azov, 49th Mountain Corps was moving along the eastern bank of the Dnepr (against 18th Army), and 54th Corps was at Perekop on the isthmus of the Crimea peninsula (against 51st Separate Army). The small 3rd Rumanian Army moved up behind the 49th Mountain Corps with its three mountain and two cavalry brigades. On 24th September 54th Corps launched a major attack with two infantry divisions against the 51st Army defending the Perekop isthmus (to the Crimea). The Germans could not outflank this fortified position because of the narrow confines of the isthmus, so the fighting was costly and the Germans made only slow progress. It wasn’t until mid October that 54th Corps (with support from major elements of 49th Mountain Corps pulled back from the Dnepr River) could break out into the Crimea proper. By 25th November 11th Army had cleared the Crimea, except for the fortified area around Sevastopol. Meanwhile 30th Corps and 3rd Rumanian Army were left holding the line north of the Sea of Azov, and had made only limited progress towards Melitopol by the end of September. Having cleared Bessarabia in June-July 1941, the Rumanian 4th Army which represented the bulk of the Rumanian’s strength on the East Front, moved to surround the fortified area around Odessa. Their objective was to take the city and destroy the Soviet garrison. As the Black Sea Fleet was far stronger than any Axis naval presence in the Black See, the Odessa garrison was well supplied and even reinforced (to 86 000) by early August 1941. The Red Army and Navy personnel defending Odessa had already been ordered to fight to the last man. The 4th Rumanian Army did not have sufficient artillery to effectively assist in assaults against prepared and fortified positions. Heavy and super-heavy artillery capable of reducing heavily fortified lines was mostly absent. German heavy corps artillery was busy supporting 11th Army. Infantry troops untrained, and not equipped, for infiltration and close assault operations (such as the German pionier troops). Generally the Rumanians appeared to have still followed obsolete French defensive theories of warfare, and accounts of the Battle of Odessa contain descriptions of WWI style costly frontal infantry assaults. Only air-parity at best over the area: the relatively small Luftwaffe force in the area gave priority to 11th Army’s operations further east. Thus the Royal Rumanian Air Force (FARR) and occasional German air support was unable to prevent Soviet naval support re-supplying and reinforcing the garrison. Between 3rd and 17th September the Rumanians had reduced the Soviet occupied area around Odessa to around half its original size, but on 21st September the Soviet s launched a sharp counter-attack against their Rumanian besiegers and actually expanded their perimeter, advancing around Grigoryevka. This battle of attrition continued until the 11th Army broke out into the Crimea in October and threatened Sevastopol. The Soviet position in Odessa now became untenable as sea borne supplies would have bean easily blocked by Axis air superiority. Therefore on 15-16th October the Soviet Black Sea fleet evacuated the Odessa Garrison (now around 121 000 men) to Sevastopol. The Battle of Odessa proved to be very costly for the Rumanians who suffered 92 545 casualties (17 729 killed), in the battle. Soviet casualties amounted 41 268 including 16 578 killed. The Battle for Odessa was arguably a defeat for the Axis forces during Operation Barbarossa. Although the city was captured it is doubtful that it was worth the cost in terms of casualties and the effect on Rumania’s ability (and motivation) to support Army Groups South’s drive east. After the battle 12 Rumanian infantry divisions, which represented the bulk of their armies in the East, were so torn up that they had to be withdrawn to Rumania for refit.